Using her childhood drawings of maps and figures, Joyce Kozloff underscores the limits of our adult understanding. Joyce Kozloff has been an artist and activist for decades, from her involvement with the 1970s feminist collective Heresies to her more recent commitment to We Make America, a group of artists creating Statue of Liberty-inspired props and signage for numerous protests against Trump. 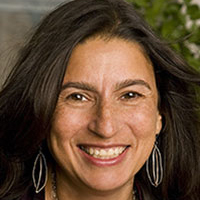 When it comes to her personal artwork, though, she is able to eschew didacticism, favoring a zanier exploration of the cultures and histories that inform current events. 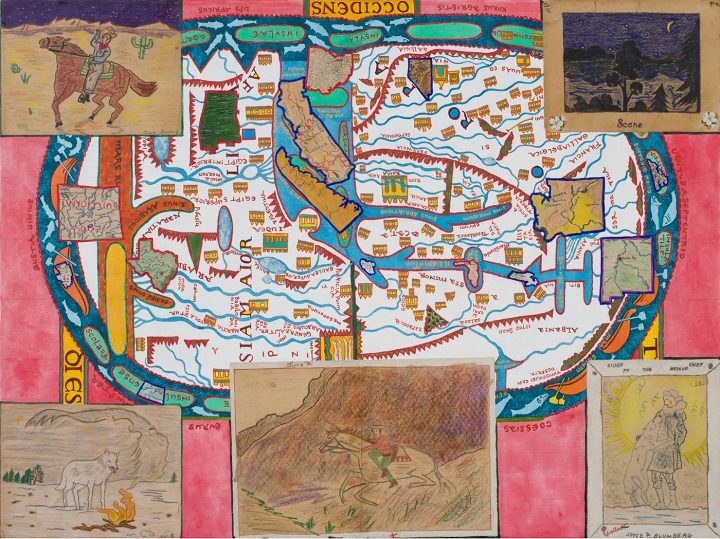 In her latest exhibition, Girlhood, at D.C. Moore Gallery, Kozloff juxtaposes her adult obsession with antiquated cartography with her own childhood drawings for social studies projects, revealing the limits of our ability to comprehend “new worlds,” both historically and personally. 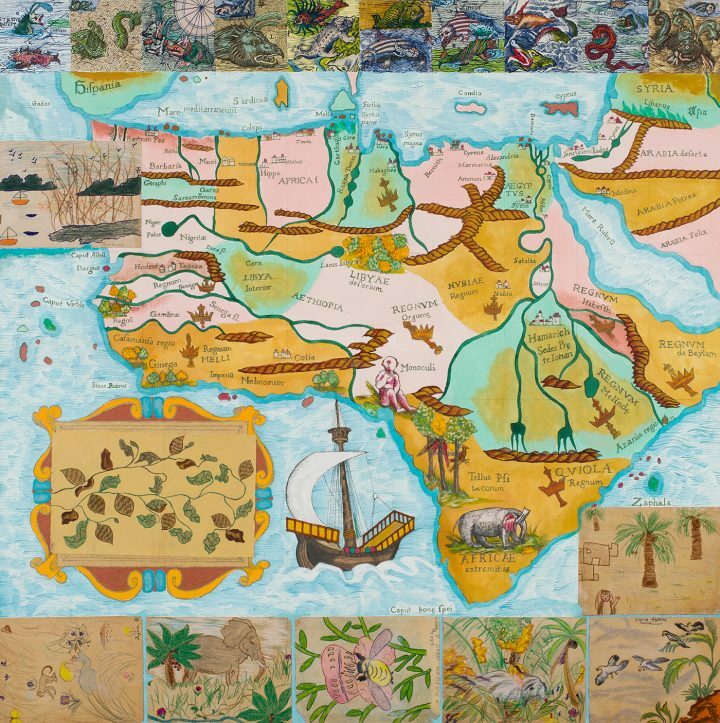 With Ranging surfaces ranging from a 17th-century map of Manhattan to a third-grade drawing of the Sahara desert, Kozloff captures both our deep desire to go to unknown lands and our cultural biases about such places. 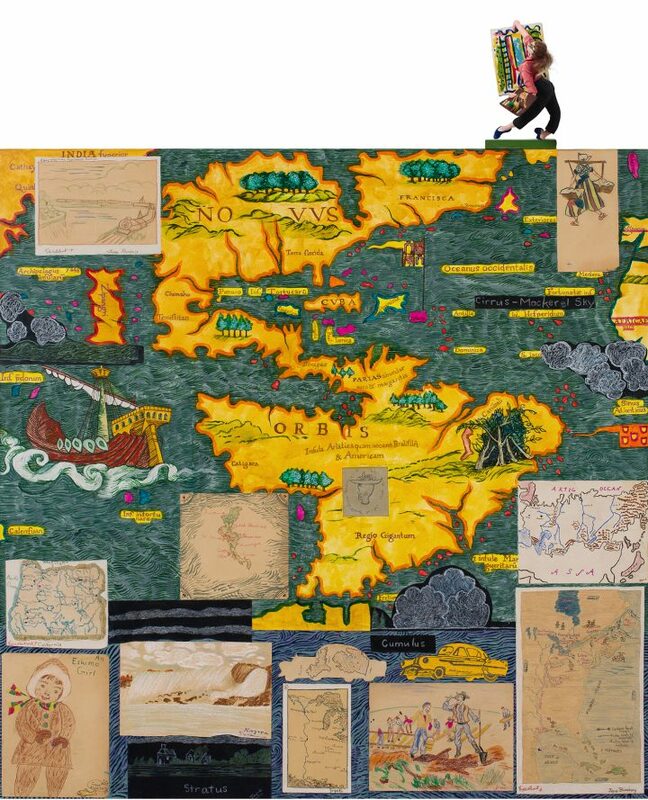 For example, in “Art Girl” (2017), an ancient map of North and South America barely follows the outline of the geography that we know today (it locates India somewhere to the northwest of Alaska). The land mass forms a backdrop to Kozloff’s elementary-school depictions of Asia, portrait of an Eskimo girl and a crayon drawing of the construction of the transcontinental railway. Topping the canvas is a doll, an Audrey Hepburn-esque figure, with a ponytail and black slacks, holding a canvas — a classic 1950s depiction of a woman artist. The dolls, which punctuate several of the canvases, were gifts from Kozloff’s parents, who would bring them home as souvenirs from their various travels. Very much cultural stereotypes, they were kept in a glass cabinet for over 50 years; Kozloff rediscovered them when she had to clear out her parents’ house after their deaths. That was also when she discovered her childhood drawings, all carefully filed and boxed, preserved for posterity. Kozloff found that her childhood interests did not differ so greatly from her adult artworks: hand-drawn maps, appropriations of illustrated books, and self-made travel booklets are all recognizable tropes of her work. All possessed her self-described “obsessiveness”— the attention to uncanny details and affinity for foreign cultures so evident in her work of the last four decades. What makes this work so relevant is the way in which Kozloff underscores our false narratives about foreign lands and cultures, exposing the way our imagination allows us to project our own cultural values on our understanding of the unknown. It is easy to look at the antique maps that she so aptly copies and see the limitations of knowledge in cultures of the past. But the same limitations also exist in Kozloff’s elementary school lessons, reflected in her drawings of elephants and palm trees, presidents and state symbols, and the dozens of maps of places she had yet to visit. In “Red States, Blue States” (2017), inspired by the recent election, a medieval map of the world places Rome at the center, encircled by Europe and the Middle East, in a disorienting manner. Pasted onto this painted background, Kozloff placed her own renditions of some US states — Texas, California, Nevada, Wyoming — from school reports. Surrounding this collage are five drawings, now faded to a tea-stained shade of brown, of cowboys and wolves and the Wild West. It suggests that, like scholars in the middle ages or any other historical period, we too live with invented, often erroneous ideas of the land we inhabit, which now, post-election, often feels threatening and foreign. In a side room of the gallery are selections from Kozloff’s 2001 – 02 series “Boys’ Art.” In these works on paper, she affixed tiny renditions of her son’s own drawings of superheroes and warrior figures to maps of famous battle sites, a commentary on the omnipresence of war iconography in our daily lives and in art history. Here, as in Girlhood, the naïveté of the childhood depictions serves to deliver a very sophisticated — and not entirely reassuring — message. Joyce Kozloff: Girlhood continues at D.C. Moore Gallery (535 West 22nd Street, 2nd Floor, Chelsea, New York) through November 4.